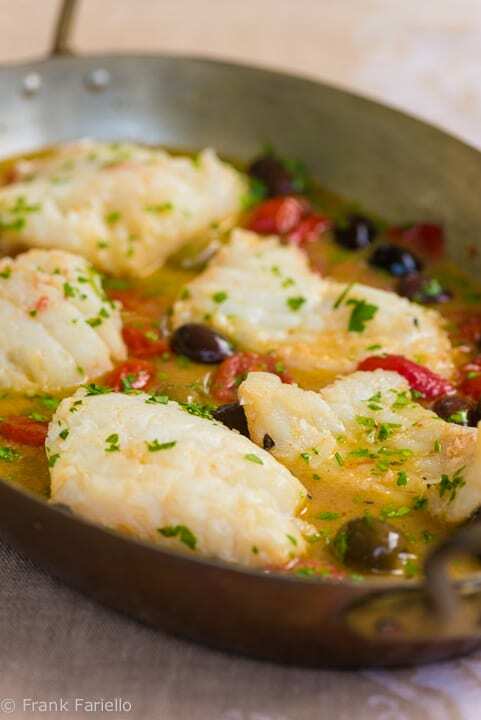 Acqua pazza, or ‘crazy water’ is the humorous term for a really easy but very tasty Neapolitan method for poaching fish. Make a garlic and oil base, throw in a few cherry tomatoes and other flavorings if you like, lay down your fish fillets, simmer for a few minutes and you’re done. You start by sautéing a few cloves of garlic in olive oil, along with the chili pepper if you want some heat, as if you were making an ajo e ojo, in a pan wide enough to fit your fish filets in a single layer. Then, letting the oil cool a bit, add cherry or grape tomatoes, which you can split in two, and a splash of white wine, along with any of the other optional ingredients you might be in the mood for. Let the tomatoes simmer for a minute or two, to soften. Place filets of a white-fleshed fish into this ‘bath’ and add enough water (or fish broth) to come about halfway up the fish. Season with salt and pepper and sprinkle with some chopped parsley. Cover partially and allow the fish to simmer gently until it is cooked through, about 5-10 minutes, depending on the type and thickness of the fish. Serve immediately, with a bit more parsley if you like for color. There are more ‘refined’ versions of acqua pazza that start with a soffrito of onion instead of garlic. Other versions start with onion, carrot and celery. Some recipes also call for the addition of bay leaf and other herbs to the poaching liquid. The type of fish is yours to choose, but firm, white-fleshed fish work best. Orata (sea bream) is probably the most typical fish used for acqua pazza, but merluzzo (fresh cod), scorfano (red fish), rombo (turbot) and spigola (bass) are also favorites—I’ve even seen recipes calling for sgombro (mackerel) although personally I’m a bit doubtful about this last option. You can also make whole fish all’acqua pazza if you like—in fact, this was the original way to make it. If you opt for using a whole fish, you will have to turn the fish over gingerly during cooking to make sure it cooks fully on both sides. With filets, assuming that they are not too thick, this should not be necessary. Place filets of a white-fleshed fish into this 'bath' and add enough water (or fish broth) to come about halfway up the fish. Season with salt and pepper and sprinkle with some chopped parsley. Cover partially and allow the fish to simmer gently until it is cooked through, about 5-10 minutes, depending on the type and thickness of the fish. Serve your immediately, with a bit more parsley if you like for color. Not at all, Catarina. Why not experiment? My only caution would be to use the breasts, perhaps pounded to thin them out a bit, as the other parts of the bird are likely to take too long to cook. Unlike the fish, I’d recommend you brown the breasts a bit in the garlic and oil base before adding the tomatoes, and the proceed from there. You might also want to use chicken broth rather than water, since the breasts don’t have too much flavor. Or, if using water, be very generous with the seasonings. If you give it a go, do let us know how it turns out. I ADORE this recipe. I serve it with parmesan potato rounds, cavolo nero cabbage and green and yellow beans sauteed in white wine and garlic oil. Made this for my husband and I with all the “optional” ingredients. We loved it! I did this with a whole sea bream and served it with some griddle toasted farmhouse bread. Was so simple and yet every flavour comes through! I will for sure make this again! Awesome that it worked so well for you, Thom. Thanks so much for your feedback! And thank you for your comment, Aka! One of the things I like about Italian cuisine is the fantasy applied to names which turns a simple dish into an attractive one. I mean, who wouldn’t want to taste some “acqua pazza”? Lovely dish, as always happens in your kitchen, Frank. So easy and so delicious. I just got back from Abruzzo, where I was lucky enough to enjoy some wonderful Adriatic fish and seafood. It’s so hard to find excellent, freshly harvested fish around these parts, though every so often I get down to the Maine Avenue market. Thanks for sharing a classic, Frank! I do wish the Maine Avenue market weren’t so out of the way…. Thanks for stopping by, Domenica! Frank – I’ve eaten this dish in restaurants and I have to say yours looks better than what I’ve ordered. I’m not in favor of mackerel for this dish either. Beautiful! You do such a wonderful job with these classics, Frank. Bravo! P.S. I’m with you on the doubts about the mackerel.